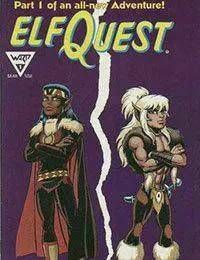 When the Original ElfQuest began, supposedly a Cosmic Egg carrying the High Ones was descending to Abode, the world of two moons. Because of the dark aura of this particular planet, the elves were sent backwards 20,000 years in time.<br />Finally, Rayek has grown mad with the potential of transcending Space and Time. He proposes to his kin to use the Palace for Time Travel, but impulsively elopes with the family home before the details of the arrangement can be agreed upon.<br />Cutter makes a deal with Picknose to seal his kinsfolk in the caves, preserved in the endless sleep that Petalwings wrapstuff provides. Thus, while rayek has left time from the world of two moons, the Wolriders escape by hibernating; all except for Cutter, who is forced to make friends with Old Maggoty and wander the surface of his world in solitude. Thus, all the Wolfriders were abandoned on Abode where able to escape the inevitable promise of death.